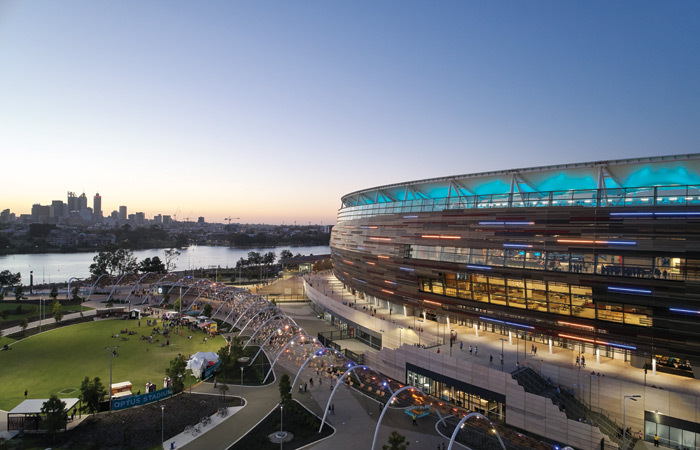 A consortium of Hassell, Cox Architecture and HKS have delivered the much-anticipated Optus Stadium, won through a design competition in 2011. The structure will be the beating heart of Stadium Park, enclosed by the banks of the Swan River. 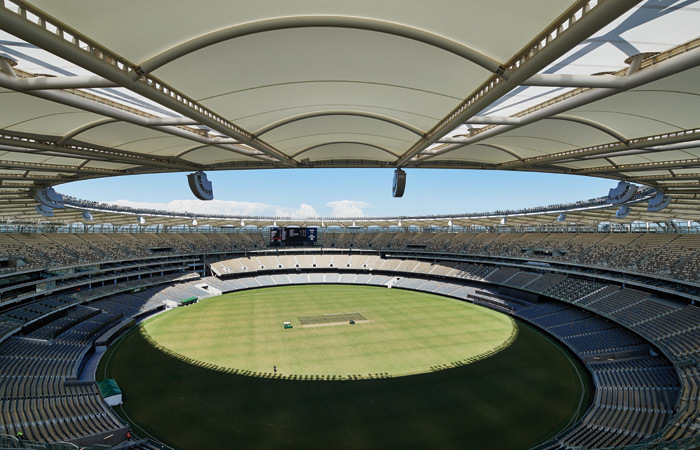 The stadium, commisioned by the Western Australia government, is impressive in itself, while the design reaches beyond the stadium walls, to the layour and landscapitn of the Stadium Park, establishing links to the Swan River. Set into the curve of the river, the site offers views of the Swan River from every angle. While the landscape is spectacular, the site was largely unreachable. The stadium now gives both a new reason to cross the river’s oxbow and two new ways to do it, via the stadium rail station designed by HASSELL, and a footbridge designed by Denton Corker Marshall and Parry and Rosenthal Architects, which will not only attract more people but also safely and quickly disperse crowds after events. Vibrancy is being brought to what was previously a piece of wasteland in the city with a scheme that functions as an active and energetic public space on both event and non-event days. 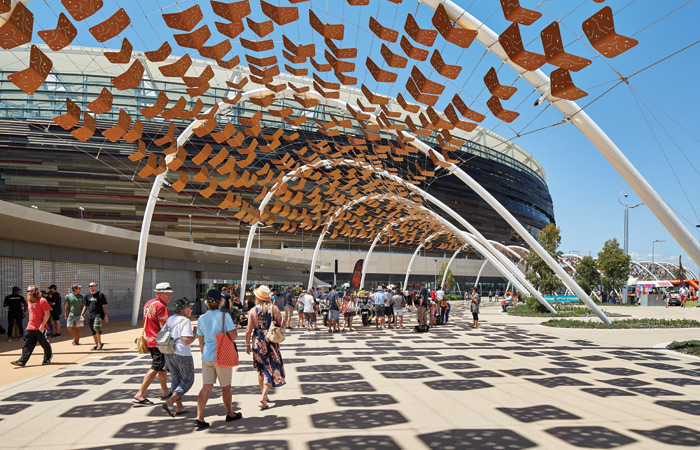 A covered walkway, called the community arbour, rolls down from the station towards the stadium into a landscaped forecourt designed to assist in crowd control. This area provides a flexible space on nonevent days for community events – adding another public space to the city that isn’t just for stadium patrons. A rigorous approach was used in the design of the stadium rail link, giving consideration to the safe and efficient transfer of passengers, with their comfort as a priority. 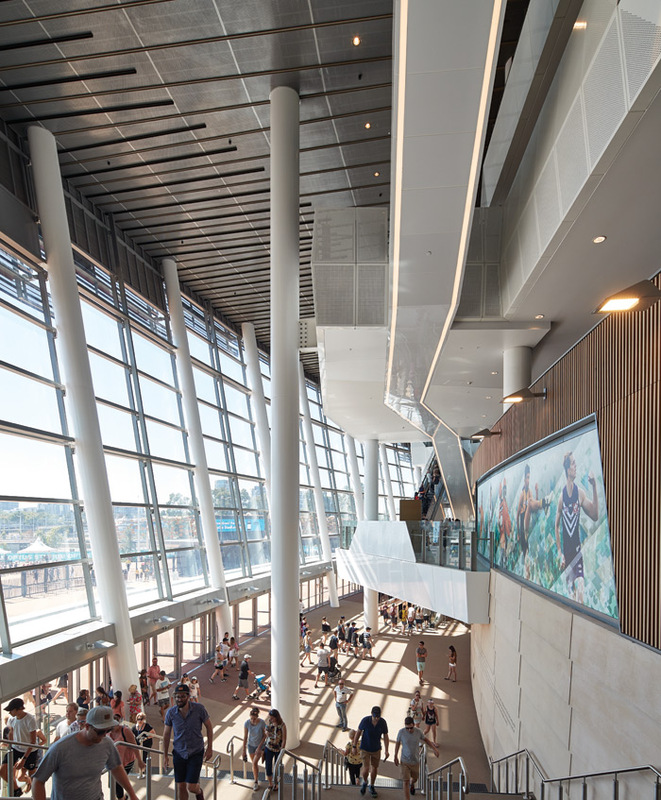 ‘The end result is a fans-first venue in a people focused precinct – a destination all-year round, for everyone,’ says HASSELL principal and design director Peter Dean. Successful in function, the scheme excels in aesthetics. The stratified bronze anodized facade is distinctive yet subtly blends into the landscape with a design that is rooted in the context, being a reflection of the geology of the area. This facade is enhanced at night through the use of LED lights in the colours of the various home teams in various sports. User experience has been considered in all aspects of the stadium’s design. The coliseum style ‘bowl’ seating facilitates excellent views from anywhere in the stadium and increases fans’ connection to the pitch. The stadium has a flexible and adaptable seating strategy that can increase by capacity 10,000 for events that don’t require the space-intensive layout of an AFL football game. Seats are 50cm-wide at the narrowest, with 85 per cent of them under a fabric roof to ensure maximum comfort in Perth’s warm climate. At night, this lightweight roof is illuminated to accompany the facade and forms a ‘halo’ to top off the structure. 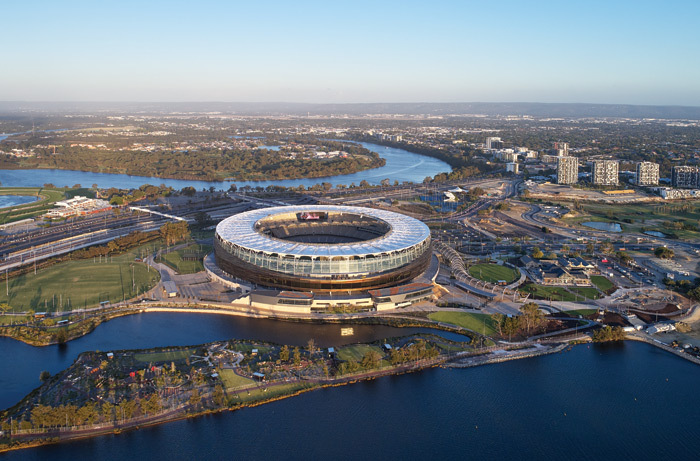 The flexibility to successfully hold a range of events and outside of its primary function as an Australian Rules football ground is what makes Optus Stadium an exemplar in stadia design. It is establishing itself as a destination even on non-event days with a range of restaurants and cafes open to the public, and the Northern Oval in the Stadium Park available for even the most amateur players to throw a ball. Paul Hyett, director of sports at HKS, says: `The stadium has been designed to maximize economic and social benefit through identifying the best strategy for the facility’s requirements and keeping an “open” range of revenue generation options and future adaptability’. An exciting future lies ahead not only with the stadium per se, but also with the new public facilities and spaces.